I am just LOVING the photos used to illustrate the point in this graphic, found on an Internet atheism community. OK, now that we’ve had a laugh, consider this: in all my 13 years of being a follower of Jesus Christ (whom serious Christians believe is the divine son of God), I’ve never met a single person who’s counting the days ’til God puts an end to this planet. Oh, I’m sure there are a few out there; maybe they’re holed up in some bizarre, remote compound with guns and emergency supplies (which wouldn’t make sense; what use would that stuff be if the world ended?). But they’re a rare and possibly damaged breed. The rest of us are enjoying the same beautiful places that atheists, Buddhists, Muslims, Jews and agnostics appreciate. The only difference is most Christians are keenly aware of who is behind not just sunny days, but every kind of day: the Creator and master of time, space and the universe. 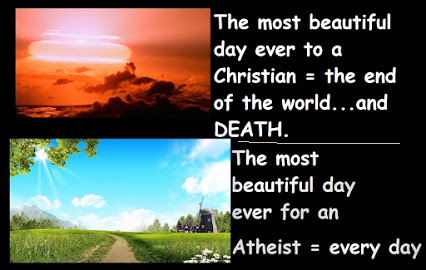 That means the most beautiful day for Christians is every day. Just like it is for the atheist person who created this graphic. All that said, there is a grain of truth here: the end of the world is coming. Sadly, there is an industry out there amongst some Christians who damage the credibility of Christianity by trying to predict that time. That’s right. YOU, and millions of other people who don’t follow Jesus, are the reason this broken, sputtering world is still lurching forward. If you believe there’s nothing beyond this life — and when you die, ALL that you are will become nothing more than worm food — then maybe these “holdouts” are a good thing to you. But if you somehow know there MUST be more than 75 years of eating, sleeping, working, having children, getting sick and leaving behind all your precious possessions, then it’s worth seriously checking out Christianity. It’s about a gift: Jesus Christ, offered to every single person on this planet, no matter how “good” or “bad” you are, how rich or poor you are, how joyous or miserable you are. That gift leads to eternal life in Heaven with Jesus. Look into it, ‘cause no matter what our culture insists, this is the most important investigation you can ever undertake. I couldn’t stop laughing at the introduction. Seriously, there are some misinformed people out there! Thank you for reprimanding them… I am a Christian and I have a great time every single day of my life! Because that is what Jesus Christ wants for me! Actually, Frank, there are extremist Christian cults that are looking forward to ”Judgement Day” and are genuinely hoping it comes ASAP. Just type Apocalyptic Christian Cuts in Google. There is more than you could ever hope for! Oh, and for what it’s worth, the character Jesus of Nazareth, ( who serious historians believe was just a man) was also an apocalyptic preacher who believed the Kingdom of God ( end of the world, Judgement Day) was imminent. His disciples believed so also and when it turned out that this was not the case things had to be adjusted accordingly. And along came Saul of Tarsus. History is replete with Doomsday Christian sects. YOU, and millions of other people who don’t follow Jesus, are the reason this broken, sputtering world is still lurching forward. Pre-Christian societies such as the Greek and Chinese were not broken nor did they lurch or splutter along. They have produced some of the world’s foremost thinkers and writers. Much of Western Philosophy is built upon the foundation of Greek thought. The Chinese had a fully functional society while your man-god was running around Palestine banishing ”demons” and sending herds of pigs to the their death. As a single entity, Christianity has been responsible for more brokenness and heinous action than pretty much anything n the planet.and continues to do so. Simply consider the genocide of the Native American Indians. Consider colossal arse-hats such as Bush who claimed he was guided by his god. Jesus expected the end of the world within a very short period of his mission. So did his disciples. This apocalyptic death-cult attitude is the hallmark of the religion, it has merely been tempered over the millenia. But you all still believe that the after-life is a) better than this one. b) Merely a sort of corporeal way station. Thanks for your thoughts and your atheist perspective on things. Much of western philosophy is also based on Christian thought. I won’t respond to your other accusations other than to write that many, many Christians have made horrible decisions over the centuries. Just as many, many atheists, Buddhists, Muslims, agnostics, Jews and others have made horrible decisions. over the centuries. P.S. I assume the Bush you refer to is the former U.S. president. I’m Canadian and have nothing to write about American politics. Once again, you moderate when the question is awkward or too embarrassing for you to handle? Why is this Frank? Are you not instructed to field such inquiries with honesty? Uh, could I have some time to respond?? Sheesh…..
Of course… but why moderate? I moderated because as owner and writer of Frank’s Cottage, I wanted a chance to reply before comments that oppose Christianity are posted. That way readers can see both sides at the same time.